Chennai : The Dubai-bound Air India Express Boeing plane seems to have overshot the normal take-off point as tyre marks have been found between the end of the runway and the compound wall of the Trichy airport in Tamil Nadu, officials said on Sunday. Speaking to IANS on the condition of anonymity, an official said: "Tyre marks were found between the normal takeoff point and the compound wall. The plane took-off somewhere towards the end of the runway." 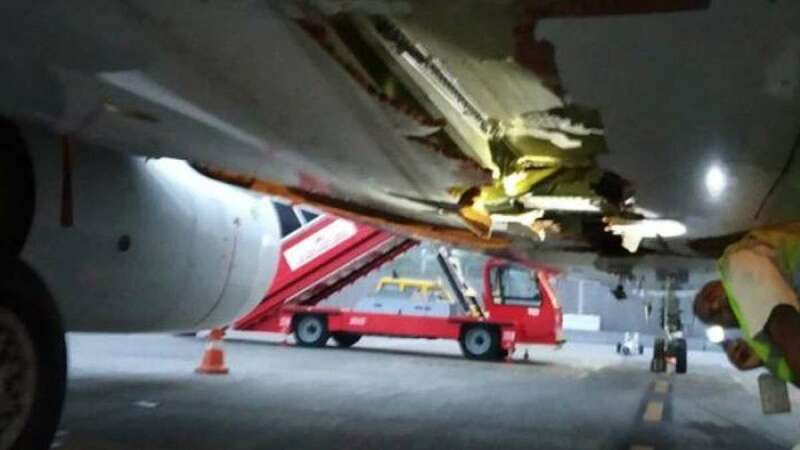 On the morning October 12, the Air India Express flight with 136 people on board had a miraculous escape when the aircraft's wheels scraped the airport's outer wall during take-off in Trichy, damaging the wall as well as the plane's undercarriage. "The aircraft hit the airport's instrument landing systems (ILS) and then the compound wall," Trichy Airport Director K. Gunasekaran had told IANS on Friday. "We informed the pilot about the mishap," Gunasekaran had said. "The pilot said nothing was wrong with the plane as the systems were functioning normally. But we found some parts of the plane like an antenna on the ground." An experienced flight navigator who sought anonymity told IANS: "On the runway there are markings including the lift-off mark. By the time the aircraft reaches that mark, it would have gained the necessary speed and power to take off safely. "By the time the plane crosses the compound wall, it would have gained about a height of 300-500 feet."